Depression and Hypoglycemia : Another Symptom? As a hypoglycemic, you may find yourself feeling constantly depressed for no good reason. Depression is a persistent of sadness, hopelessness or despair that is so severe that it affects ones ability to function properly or carry out necessary day to day activities. Although negative feelings about oneself can be caused by a variety of reasons, many hypoglycemics find themselves feeling inexplicably depressed for long periods of time even though there is not obvious reason for their feelings. It has been reported that up to 70% of hypoglycemics have felt severely depressed at some point. Depression in hypoglycemics is usually accompanied by anxiety, irritability poor concentration feelings of panic and suicidal thoughts. Many people suffering from depression go from doctor to doctor, or from psychologist to psychologist looking for the root cause of their problem, all the while ignoring one fundamental and very likely cause of their negative feelings: their diet. Some hypoglcemics are put on very strong and addictive medications to alleviate their negative feelings, when all that is needed in many cases is a change in their hypoglycemia diet. Is my diet really making me depressed? Well, if your diet consists mainly of sugars, alcohol and certain type of 'bad' carbohydrates then in a word yes it is likely that your hypoglycemic diet is causing a large part of the negative feelings you are experienced. Many nutritionists and researchers have concluded that over consumption of the wrong sorts of foods can cause havoc on our body chemistry and one of the side effects of this can be depression. This is because if we consume too much of certain types of addictive foods such as sugars, our bodies quickly become dependant on these foods as the brain is encouraged to produce chemicals such as beta endorphin which gives us a temporary high. However once we stop eating such foods our bodies stop producing these chemicals and we begin to feel down. Thus we eat more and the cycle continues. So if I just stop eating sugars should I feel better? Then how can you come off these harmful foods and help ease your negative feelings? Well if you think you are depressed, you should firstly speak to a suitable qualified healthcare pracitioner who should be able to give you a correct diagnosis. However, you should also try and eat correctly in order that any negative feelings that have been caused by your diet can be eliminated. There are many things that can be done to alleviate your negative feelings. These include exercise and diet changes and also ensuring you receive the correct amount of rest and relaxation. 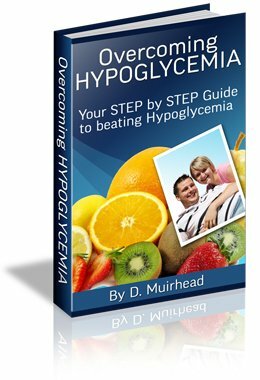 In the Overcoming Hypoglycemia Ebook you will find detailed information on how to make the necessary changes in alleviating your negative feelings including tips and step by step guides that will put you firmly on the road to recovery. Which natural anti-depressants may be able to help you. How can changes in my diet help my negative feelings?